Cheatcatcher first appeared on the web way back in 2003 recommending ways for people, male or female, to check if their partner was cheating on them. With the internet revolution and computer ownership increasing virtually exponentially opportunities for Cheaters (and Catchers!) has grown by leaps and bounds. Cheatcatcher discusses the latest cheating issues, especially those that are based ( or start) online and discusses tips, techniques and available technology to catch a cheater online or off. Monitoring computer activity, secretly in the background. Checking phone and public records of suspicious individuals in your partner’s life. Secret cameras and voice recorders placed in the home, the list goes on and on. You choose the level of surveillance you feel is justified and that your suspicions warrant. My story is that I was cheated on by my, at the time, wife who was communicating with her boyfriend via phone texting and email. Setting up meetings and making me look like the fool I was for not suspecting anything. When I look back at how naive and trusting I was it makes me plain sick! The fact is that while I could never, of course, ensure her fidelity but if I’d only known then what I know now the whole sordid thing would not have played out over 3+ years AND I might still be living in my own house! The guy even now drives my car! Pretty emasculating don’t you think? The fact is that because I had no ‘proof’ of her infidelity the judge accepted her plea of ‘irrevocable breakdown of the marriage‘. I realize this applies to men AND women ( maybe especially women) who just don’t know what their other halves can get up to online and off, safe (until now!) in the knowledge that they’d never get caught out. Essentially I wanted to set up Cheatcatcher.com to be a site where anyone could find out how to be aware of the warning signs and, if they were real, to get pro-active and go get the proof if it was there. I lost my home and my children because I wasn’t informed – and I’d done nothing wrong! That ain’t right! Yes I know it seems a bit seedy but if your significant other is screwing around behind your back then that’s seedier in my opinion! If they’re not? Well now you know for sure and that’s great! 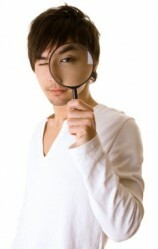 No, I didn’t use a Private Investigator ( above) to find out what was going on – because I was totally in the dark! The truth is that I still feel like a total idiot, using 20/20 hindsight, and kind of dissipated my anger by getting this site together. While I was doing my research I found stuff that was going on that made me go, “Woh!” in that there’s so much crazy stuff going on online it can just blow your mind! Really! Listen! I really hope your relationship is strong, that it will last BUT you are not being unfaithful when you check up on your other half to make sure that your relationship is strong and secure! They never have to know and, sure, it can seem a bit ‘tacky’ to investigate a loved one but better that than getting the BIG BAD NEWS one day out of the blue!